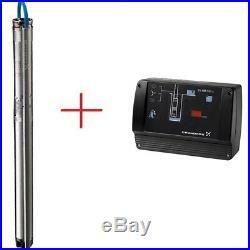 Grundfos SQF 2.5-2 Submersible Solar Powered Water Pump + CU200 Control Unit. Grundfos SQF 2.5-2 Submersible Pump Motor, for horizontal and vertical mounting, MSF3 1 x 90-240V, Rp 11/4 -10%/+6%, 50/60 Hz, 2m motor cable with integrated MPP-tracking. The Grundfos SQF 2.5-2 3 solar powered borehole pump with helical rotor is ideal for high head low flow applications. The Grundfos SQFlex solar powered submersible pump rangeoffers an alternative solution for powering submersible water pumps using renewable energy. The SQFlex system is based on renewable solar energy and combines state-of-the-art technology with sustainable, energy efficient solutions to provide a reliable water supply to remote locations with little or no access to electricity. The Grundfos SQF 2.5-2 has in-built protection features which protect the pump and well, these features include. Protection against dry run: turns the pump off when it detects a low water level. Stainless steel pump casing for long pump life. Continuous load condition and voltage monitoring. Sand slinger; to ensure protection of motor and thus extended motor life. System efficiency: Maximum Power Point Tracking (MPPT) means even and high efficiency regardless of power source. The Grundfos SQF 2.5-2 high quality solar powered pump and SQFlex system: offers cost effective pumping and a reliable water supply. Once installed, the system requires virtually no maintenance and is ideal for remote locations, where grid electricity is absent or unreliable, or when renewable energy is the preferred source of electricity. 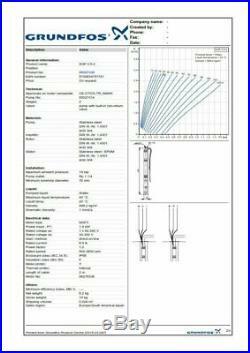 Grundfos SQF 2.5-2 specification. 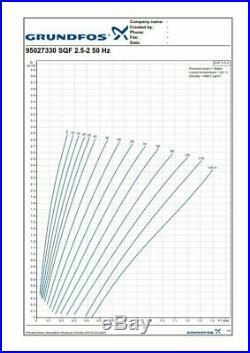 The noise level is lower than the limit values indicated in the EEC Machinery Directive. SQF complies with EMC Standard 89/336 / EEC. Approved according to EN 50081-1 and 50082-2. Reset function: SQF can be reset via the CU 200 or by switching off the power supply for 1 minute. Power factor: PF = 1. Voltage: 230VAC, -10% / + 6%. The output of the generator must be min. Power by: solar panels, wind power, generator or batteries. Liquid: 0 ° C to + 40 ° C. Voltage: 30-300 VDC or 1x90-240V, 50 / 60Hz. 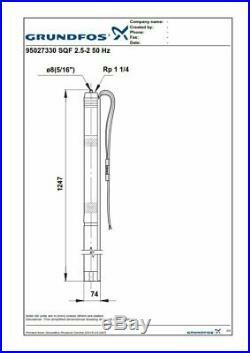 The Grundfos SQFlex 2.5-2 pumps are suitable for. Villages, Colleges, Hospitals, Single-family homes, etc. Farms, Watering plants, Irrigation of fields and greenhouses. Natural parks, Pumping of surface water. 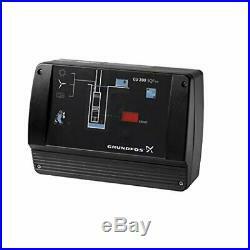 The CU 200 control unit is a combined status, control and communication unit especially developed for. Furthermore, the CU 200 enables connection of a level switch. The CU 200 incorporates cable entries for.. Communication between the CU 200 and the pump takes place via the pump power supply cable. Is called mains borne signalling (or Power Line Communication), and this principle means that no extra. Cables between the CU 200 and the pump are required. It is possible to start, stop and reset the pump by means of the on/off button. The CU 200 control unit offers. The following indications allow the operation of the pump to be monitored. Water reservoir is full (level switch). The CU 200 offers the following alarm indications. Service needed in case of. In addition, the CU 200 shows the symbols of the energy supply options. Range of ambient temperature: 30.. Rated voltage ac: 1 x 90-240 V. Rated voltage dc: 30-300 V. Enclosure class (IEC 34-5): IP55. The item "Grundfos SQF 2.5-2 Submersible Solar Powered Water Pump + CU200 Control Unit" is in sale since Wednesday, March 20, 2019. This item is in the category "Business, Office & Industrial\Hydraulics, Pneumatics, Pumps & Plumbing\Pumps & Pump Accessories\Deep Well & Borehole Pumps". The seller is "alexsupply_uk" and is located in Dagenham.